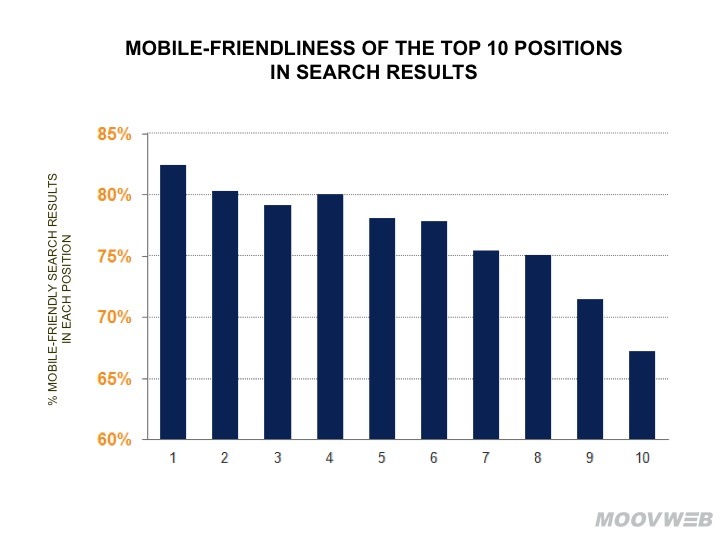 Mooveb’s recent study shines some light on extreme correlation between mobile friendliness and high organic rankings on Google. You can easily spot a correlation with the naked eye. Mobile friendly websites are mostly placed in higher spots and as the SERP position declines, so does the percentage of eCommerce websites that are mobile friendly that occupy those spots. Their study found that for keywords that eCommerce websites target, 83% of all first spots on Google are occupied by mobile friendly websites. Even if this correlation wasn’t so big, you should still do everything in your power to make your website mobile friendly since it’s not just an SEO issue, it’s a huge usability issue as well. There are several approaches you can take to make your website mobile friendly. We wrote about some upsides and downsides of those approaches before. To make the long story short, for eCommerce websites we definitely recommend the responsive website design approach. Magento comes with a responsive theme by default that you can easily modify, or we can build you a completely custom responsive design and theme that perfectly fits your needs. I pass Google’s mobile friendly test so I’m mobile friendly right? Not necessarily. Tools like Google’s mobile friendly test can be fooled as they look at a certain set of “features” that make a website mobile friendly in a very technical way. Passing that test doesn’t necessarily mean you’re offering a good mobile user experience to your users. That test can’t detect if your website loads fast enough to be usable by those users, or if all of the content available on desktop is available to your mobile users as well. That test can’t check if your mobile users can use all of the navigation options. It can’t check if your site search works properly for your mobile users. Your steps in checkout. So how do you figure out if you’re trully offering a great mobile experience to your visitors? You can do it on your own if you know what you’re doing or if you need a fresh set of eyes to go through it, you ask for an audit. While the usability audit will give you suggestions on how to improve your users experience (both mobile and desktop), you can combine it with an SEO audit which will insure everything is in place on that field as well. Initially, determine if Google sees your pages as mobile friendly. It matters not if you believe they’re mobile pleasant or your firm informs you that they are. What matters is just what Google figures out algorithmically due to the fact that it has 100 percent control over how your website ranks.